HSM baling presses can be used almost anywhere for the economic disposal of waste material. Large-volume material which is fit for recycling such as paper, cardboard, other packing material and plastic foil can be compressed within short time with the efficient HSM 35. This baling press with optional 6fold strapping is optimally suited for compressing strongly expanding foamed material. The extra large loading aperture of 2100 x 740 mm allows convenient loading of bulky material. 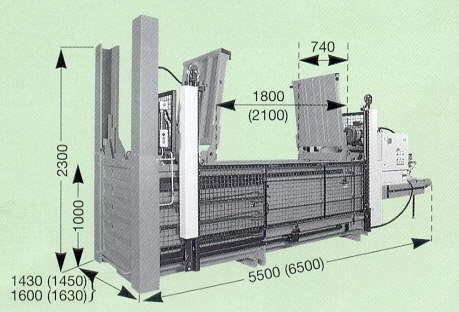 The hydraulic closing mechanism of the loading flaps of the HSM 35/2100 pre-compresses projecting material during closing. Like all HSM baling presses the HSM 35 is characterised by perfect internationally patented design, sophisticated technology and favourable series production in modular design.